Linnea , This site is about sailing a 36 ft junk rigged boat. Chinese Lugsail , An archived page, may load slow. How to Make a High Performance Polytarp Junk Rig, on duckworks. JESTER: A SHORT HISTORY , A famous ocean crossing racing junk rigged boat. Junk Sail, a tutorial , On the cheap pages. Voyage of the dragon kings , A traditional style junk. Mast and Sail in Europe and Asia , An e-book on various historical rigs. Don't miss! A crazy rig (pic) genius!!!! Moondance , A sprit sail with a topsail. Never seen that one before! Tuning traditional Sailing Rigs , How to tune lug and sprit sails. Rigging the Goat Island Skiff , How to set up a balanced lug rig. The Times and Tools of A.P.Lord , An ebook about a sailmaker of days gone by. The Crabclaw Rig , An article on the suitability of the crab claw rig for cruising. 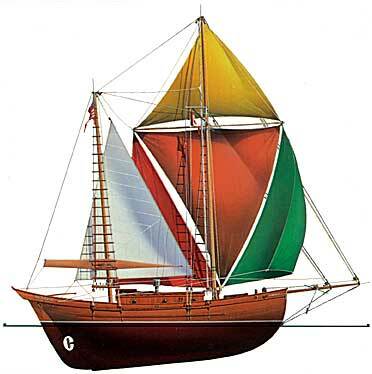 Fleche prototype , A mast aft sort of lateen sail.